We are an innovative company based in Scotland, we design, manufacture, install and commission container handling systems for consumer packaged goods. Our recognised Core & RApid ChangeOver Parts (RACOP) system offers our strong client base multiple business benefits including: faster set-up time, increased capacity and a variery of other related operational improvements. 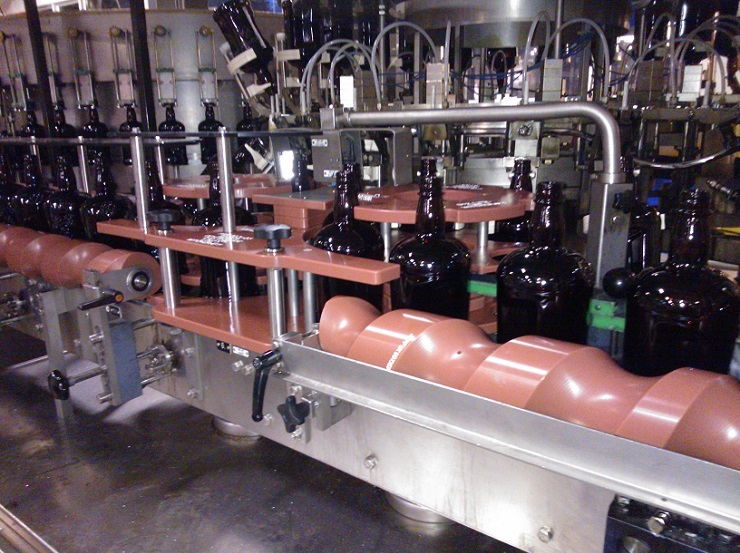 Zepf UK's main products are container handling Changeparts, Feedscrews, Multi-position parts, Adjustable guiderails and a wide range of other quick release components for the bottling & packaging industry. Our traditional quick release changepart system is known as "Core and RACOP". Every set of parts comprises 316 stainless steel core components, which become a permanent fixture to the machine, and the RACOP (RApid Change Over Parts) that are the removable coloured plastic handling parts which are custom-designed for a specific container. • Size changeover time is reduced significantly as parts are quick release. • No tools are required. • No set-up or timing of parts is necessary. • RACOP parts can be designed and manufactured to weigh less than OEM parts. • Minimal training is needed. • Changeover is manageable by all production staff. • Colour coded and custom engraved parts for easy identification. Zepf UK continually invests time and money to improve the designs of our products. The development of 2-position, 3-position and multi position changeparts has successfully achieved reduced changeover times and eliminated a range of manual handling issues in many instances. • Fewer parts to store. • More product time available. • Drinks / Beverages: Sprirts, Milk. • Personal Care: Shampoo and Conditioners, Soaps and Shower Gels. Using the same principle as our quick changeover machine parts Zepf UK has developed a unique quick size change guide-rail system which enables repeatable change-overs to be carried out quickly and accurately by all production staff. 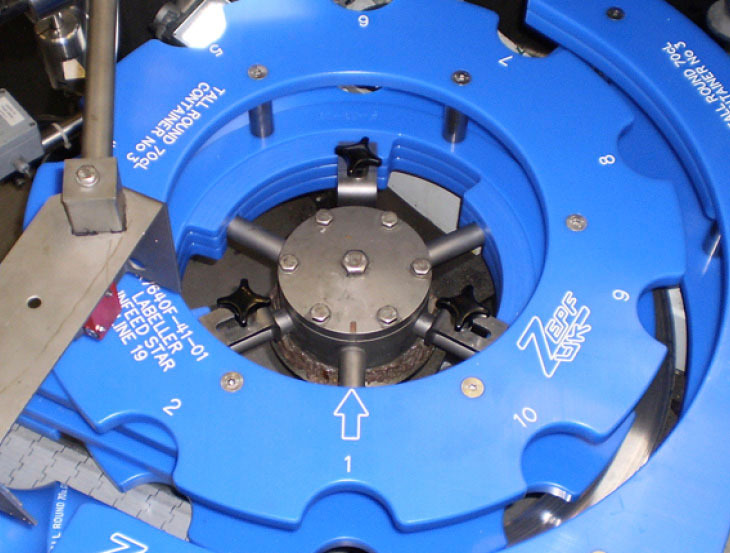 Width setting is achieved using a multi positional cam disc to both adjust and lock the guide-rails in place. Each container guide width is indicated by a dedicated colour insert on the positional disc. • Fast ramp up / no adjustment. • Drinks / Beverages: Sprirts, Wines, Beers, Water, Soft Drinks, Coffee, Milk. • Guide rails can be installed on most conveyor systems. If a machine has a number of existing OEM (Original Equipment Manufacturer's) standard parts and it would not be cost effective to convert to our quick change systems Zepf UK have the capability to measure the machine, design and manufacture additional sets of parts for other containers. • No need to replace existing parts. • Can be manufactured with less weight than original OEM parts. • Aerosols: Antiperspirants, deodorants, Air fresheners, Hairsprays. Our range of complementary products add further levels of standardization and build on the quick changeover methodology for our customers. Changepart storage trolleys facilitate excellent levels of 5S with all parts stored in an organised and well thought out manner. This helps facilitate optimum changeover times, clear visibility of the condition of the parts and much improved ergonomics making manual handling much easier than conventional storage solutions. Single and multi-position container platforms further simplify the process on many rotary machines. Neck and body guides/grippers add higher levels of mistake-proofing and accuracy into the changeover process. Zepf UK use advanced 3D Computer Aided Design (CAD) and Computer Aided Manufacturing (CAM) modelling and manufacturing software which has been customised to meet the requirements of the most demanding of customers.